After years of filmmakers fist-pumping the military superiority of the United States of America in cinema, Lone Survivor comes along to demonstrate that Americans have finally crossed over into the realm of their British forefathers, and have commenced celebrating failure in armed combat. Writer/director Peter Berg captures the raw intensity of combat and carnage on both sides of the battlefront and the heroics that forge an indelible spirit in combat. A special unit of the U.S army, led by Marcus Luttrell (Mark Wahlberg), are sent on a mission to capture or kill a Taliban leader in Afghanistan. Michael Murphy (Taylor Kitsch), Danny Dietz (Emile Hirsch), Matt ‘Axe’ Axelson (Ben Foster), and Luttrell bunker down in the mountains in search of their target, but soon find themselves outnumbered, unable to call for help, and fighting for their lives. If you’ve read the title on the film you’ve already seen too much and Berg’s film is graced with a name that’s unforgiving to the narrative. Yes, the film is based on an autobiography written by the real Luttrell, but last year’s Captain Phillips proved you could keep the plot of a well-known true story shrouded in mystery as long as your audience didn’t get too heavy handed with Google. Working with a crutch of a title and opening scenes that are even more taxing on the outcome, there is an incredible amount of pressure on Berg to implement the ‘how’ element of the story. Berg overcomes the challenge with the precision of the army commandos he’s portraying. After a brief courting period with the team the stakes of their personal lives are established with wives waiting at home, weddings being planned, and looming fatherhood all prefaced. There is an authenticity to the way each actor portrays the soldier they are playing which must have been daunting considering the pressure not to sully the memory of these men. Going through the motions of the mission objectives and the military jargon all add to the reality of the situation. Berg takes his time getting to the conflict and the anticipation of the skirmish is extreme because you’re expecting the worst and that’s exactly what you get. The skirmishes are gut wrenching in their brutality and Berg puts you in tight confines of makeshift foxholes and rifle sights to amplify the claustrophobia of the situation. It’s heart stopping watching the soldiers scramble across rocky outcrops and tumble down cliffs with their bones crunching against trees and boulders; the stunt work is astonishing. Berg trips up a little on a few slow motion edits that break the gritty realism but when the unit take stock on their ghastly wounds you’re jolted back into the hopelessness of the situation. Wahlberg, Hirsch, Kitsch, and Foster are cool headed early in combat but you slowly see shock and fear overtake the bodies. Each actor sells the utter terror of the situation and there is a visceral element to the performances as each character is mutilated beyond recognition. Hirsch, Kitsch, and Foster give an incredible amount of emotional weight to the moments where their characters must face their fate that’s incredibly moving considering the plot is shackled to a definitive outcome. Berg tries to balance the perspectives of the Americans and Afghanis in their shared disdain of the Taliban and it’s a clunky alliance. The Taliban are just bad guys with beards, scarves, and guns, there is no sense of their drive besides a pure hate for the Americans. Understandable that this is absent in an American film, but it would have had real power if the terror of Taliban on their own people was on show and not directly linked to the war. 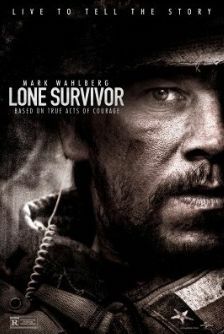 Berg’s biggest accomplishment is properly ingraining Lone Survivor with the fortitude to acknowledge that the mission was a disaster which does not often happen in American war films. Sure, movies made about the Vietnam War showed a darker side of the campaign (Apocalypse Now, Platoon, Born on the Fourth of July, Full Metal Jacket) but they were tinged with a sense of madness, the psychology of being a soldier, and the pain of denial over the botched campaign. The glory of death in battle in a senseless war resonates through Lone Survivor above of any patriotic bravado. Berg reboots his career as a director (see Hancock and Battleship) with this harsh tale of war. Well argued review. You reacted more positively to this than I, although the central firefight is exhilarating stuff. Good review. However, these were US Navy SEALs, not a unit of the Army.